What eventually became known as the “Rumba Capital of the World,” thanks to I Love Lucy’s Desi Arnaz, historic Española Way has been bringing European vibes to South Beach since 1925, when it was conceived by two Miami real estate locals, N.B.T. Roney and Walt Whitman. The charming area spans about two blocks and comes to life with Spanish Mediterranean architecture, pink stucco buildings and terracotta tiled roofs, as well as twinkling lights that turn on at night and hang from pretty palms lining the pedestrian-only block of bars, boutique hotels, shops, and restaurants. Various episodes of the Miami Vice series were filmed here and yet, Española Way still feels as if it’s a bit under-the-radar. Escape washed-up Washington Ave. and busy Lincoln Road here. It’s easy to spend a jam-packed night eating, drinking, laughing and dancing without leaving the block, where you’ll find Mexican, Cuban, Spanish, Italian, Brazilian and French cuisines and—dare I say—the friendliest service in town. The best news? Your comfy hotel bed is mere steps away. I stayed at the El Paseo Hotel, which recently underwent a huge renovation (Española Way, itself, completed a $2.5 million renovationjust last year). Known when it was built (also in 1925) as the Española Way Art Center, the boutique hotel comprised of five three-story villas, was frequented by Cuban artists and still encourages guests to explore their creativity today. This hidden spot, nestled between two businesses, has spacious guest rooms with living areas (some rooms have kitchens, too), a communal library with books and an outdoor balcony, and is just above Española Way, a hop and a skip from the Miami Beach nightlife. Looking down on the block after hours is reminiscent of the heart of New Orleans, which also has a European feel and rowdy crowds. Drown out noise with a relaxing shower and a little TV before bed. There’s a chance you may not even hear the sounds below after indulging in a drink or two too many. Of the 10+ dining establishments (over 20 merchants total including cigar shops, coffee, boutiques and more) on this small street, it’s easy to get carried away and/or overwhelmed so my suggestion would be to try a little bit of everything until you can’t eat/drink anymore. On my trip, I enjoyed the perfect margarita (not too tangy, not too sweet, with just enough salt around the rim) and chips with four different salsas at Oh! Mexico. From there, I crossed the street to Havana 1957 and was greeted by the most enthusiastic server who brought out a couple mojitos with fresh sugarcane, Cuban sandwiches and a super juicy, tender and flavorful chicken accompanied by rice and maduros (sweet plantains); this plate was more like a platter—and I’m not complaining at all. If you think I tapped out after this, think again. The night was young and there was still dessert (and more fancy drinks) to be had. From Havana, I crossed the street yet again and settled in at an outdoor table at Mercato della Pescheria, a cute Italian spot where all the servers I spoke to, and even the host, were from Napoli and had the endearing accents and attitudes to prove it. I tried the life-changing Tiramisu here, made with imported Lady Fingers, espresso, and Belgian dark chocolate before mascarpone, freshly whipped right before my eyes, was added in dollops as the final topping. The dish is incredibly decadent and I washed it down with a glass and a half of prosecco and some banter with the server before heading to my night’s final destination, Tapas y Tintos—just a couple doors down from Mercato, where I was able to catch the tail end of a fun flamenco show. The restaurant hosts live performances twice weekly and its menu includes tapas, paella, and authentic Spanish sangria. Too full to even look at another plate, my friend and I toasted to health, wealth and future travels with a larger-than-life glass of white sangria before wobbling back to our room, thankful we didn’t have to call a car to get there. 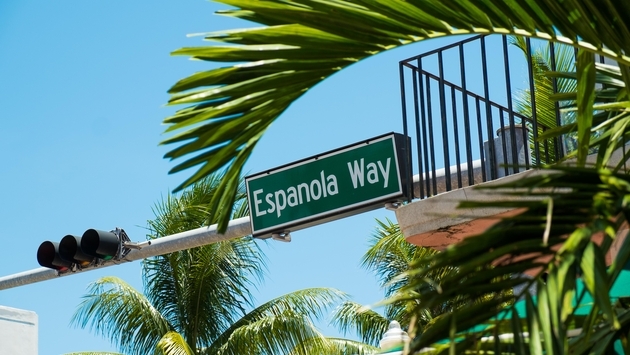 Don’t forget to check Española Way’s calendar of events before visiting. The street hosts Yoga a la Española every Saturday morning and a myriad of events open to the public throughout the year, including an arts & craft market, live opera, Salsa Thursdays and more.